For Teutonic Tuesday, I have two Porsche 911 Turbos, released 11 years apart, by Matchbox to show. 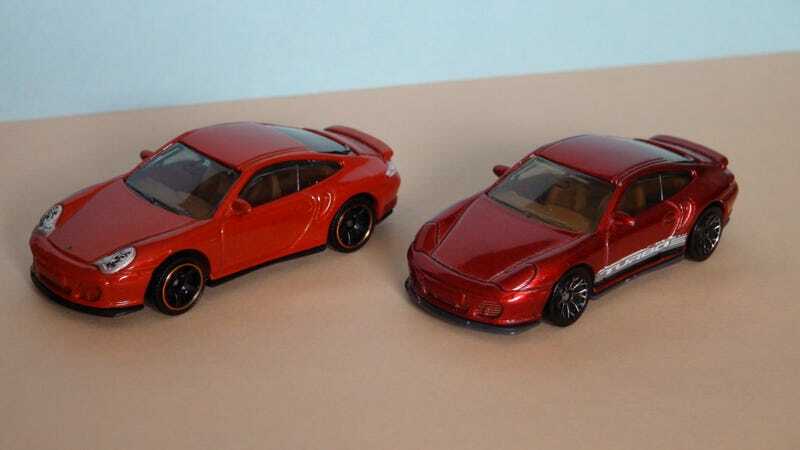 The one with the lace wheels and Turbo graphics is a metallic red 2005 mainline release, while the one with the five spoke wheels and tampo light details in an orangey-red is from the 2016 Exotics 5-Pack. The two 911 Turbos here are of the 996 generation of the 911, which was introduced for the 1999 model year. This generation was quite a departure from previous generations, having a redesigned exterior and new water-cooled engines. Some criticism was directed at the headlights for the overt resemblance to the Boxster’s headlights. The 996-generation 911 Turbo was introduced for the 2001 model year. It featured a twin-turbocharged 3.6L engine, producing 420 hp, paired with all-wheel-drive. This generation is known for introducing the Turbo S model and carbon-ceramic brakes. This casting is fairly detailed, with cleanly molded vent lines, mirrors, and rear spoiler. Overall, the proportions appear fairly accurate. The orangey-red 5-Pack release features tampos for the front and rear lights, Porsche crest, rear turbo script, and rear license plate. The metallic red mainline release only has Turbo graphics on each side. The tan interiors in both are quite well done, with a spoked steering wheel, center console, and thin molded bucket seats. The underbody is very detailed with numerous components cast into the base. The scale given is 1:58. Generally speaking, fewer diecasts appear to be produced for the 996 generation than pretty much any other generation. While researching for this post, I discovered that my 2005-release has apparently uncommon lace wheels, compared to the flower wheels.